We get a lot of questions in regard to how much CBD one should take when using cannabidiol as an alternative or supplement. Due to FDA concerns, we cannot give specific advice on how to use CBD for a particular condition. 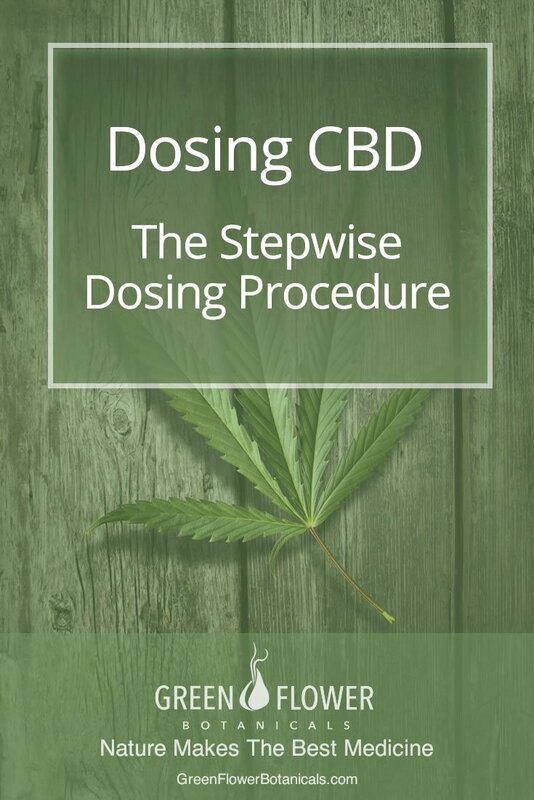 Fortunately, the process of finding the minimum effective dose of CBD for any condition is quite straightforward, using a technique called the Stepwise Dosing Procedure. What is the Stepwise Dosing Procedure? The Stepwise Dosing is a process by which you first establish a minimum baseline dosage, then adjust the dosage incrementally over a set period of time – typically 3 days. This is continued until the effective dosage is established. On that note, it is important to recognize that everyone responds a little differently to CBD. Consequently, there is no set dose for everyone or every condition. By following the Stepwise Dosing Procedure, you can easily find your most effective dosage of CBD which will vary depending on different factors such as age, weight, metabolism, etc. Start Low and Go Slow : The first step to finding your minimum effective dose is to establish a baseline dosage. Since many people report desirable results with CBD at low doses, we suggest you start with a least dose possible and slowly increase the dosage until you are comfortable with the results. As a rule of thumb, start with a small baseline dosage between 2-5mg, two times or three times daily (6-10mg total). Maintain your baseline dosage for 7 days, taking note of how the CBD interacts with your body (see note below). If you are not receiving the benefits you were expecting after the initial 7 days of taking your baseline CBD dosage, then increase the daily dosage by 1-2 mg every 3 days until you find the dosage that is most suited to you. Once you have determined your minimum effective dose, you may wish to decrease your dosage by one step to see if you can maintain the benefits at a slightly lower dosage. Important Note: Typically, people decide to try CBD because of a specific condition, only to find it helps other areas of their health as well. Remember, your endocannabinoid system runs throughout the entire body at a cellular and sub-cellular level. CBD is a whole-body compound. When you start taking CBD for the first time, pay attention to everything going on in your body. Do not be surprised if you find various benefits from your dosage. About Sleep: Often times, certain conditions or side-effects from medication can create insomnia. Sleep is essential to the bodies healing and recovery process. If sleep deprivation is an issue, you may want to consider increasing your dosage slightly at night, to assist with a more sound sleep. 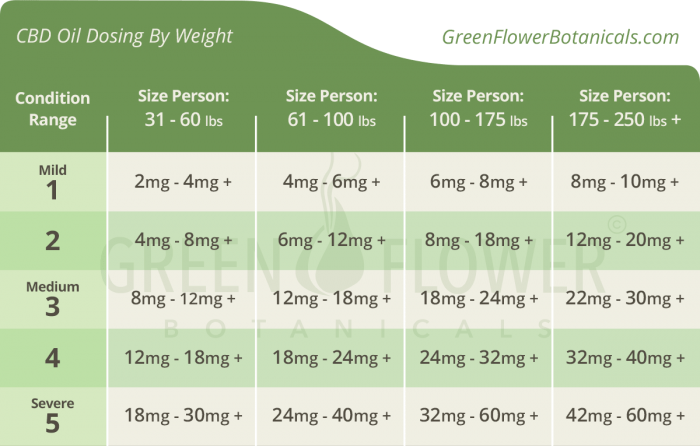 If you feel you need a higher dosage, we have created the following chart to assist you in establishing your baseline dosage depending on your weight. This chart is submitted as a suggestive guide only and is not meant to take the place of a qualified physician. This chart has not been approved or evaluated by the FDA for the diagnosis, cure, mitigation, treatment, or prevention of any disease. This chart is submitted as a suggestive guide only and is not meant to take the place of a qualified physician. This chart has not been approved or evaluated by the FDA for the diagnosis, cure, mitigation, treatment, or prevention of any disease. Once you have established a minimum effective dose using the stepwise dosing procedure, the following chart will help you determine which sublingual oil potency will best meet your daily dosage requirement. To find the best product match for your dosage simply match your daily dosage to the row on the chart labeled “30 Day Supply in Bottle”. For example: If you need 8mg CBD daily then according to the chart you would need a 300mg product. The chart also acts as a guide to how to use the glass dropper to measure out CBD in milligrams. *You must be 18 years of age or older to purchase vaporizer products. Not recommended for children. 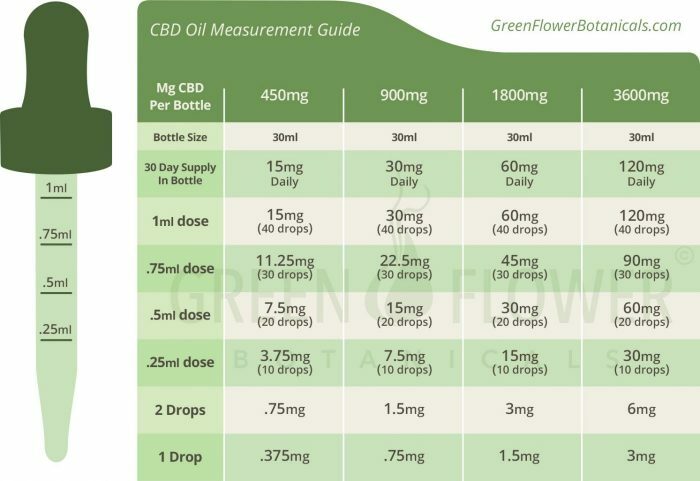 Once you have established a minimum effective dose using the stepwise dosing procedure above, the following chart will help you determine how to measure milligrams of CBD using either our 250mg or 500mg CBD Vapor Cartridges. As an example, if you needed an 8mg dosage, the chart shows several options to dial-in that dosage using a vape pen. To get 8mg total CBD you could choose to take four 4-second puffs or you could choose two 8-second puffs. A puff is measured by drawing on the vape and counting seconds as 1-1000, 2-1000, etc. Keep in mind everyone will draw their puff a little differently so the values on this chart are only best approximations. 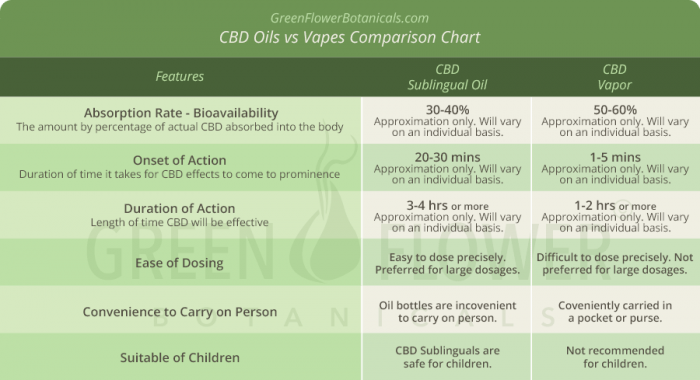 Sublingual Oils vs Vapor – Which Are Best? Looking at the comparison chart you can see the differences between these two popular delivery methods. CBD sublingual oils are taken by placing the desired amount of drops under the tongue and holding for 40-60 secs before swallowing. CBD Vapor is taken by puffing on a vaporizer pen (vape) with the desired CBD vaporizer cartridge. Many people do not like vaping so the choice to use a sublingual oil is easy. Others may choose a vapor product over a sublingual oil because of the higher absorption rate, faster onset and convenience of carrying it on your person. Some prefer the sublingual oils because the effects last longer, it is easier to dial-in an exact dosage, and easier to take higher dosage servings. Many customers will opt to do both, using the sublingual oil for the main dose and a vape pen to supplement between doses. This is especially helpful for people tackling anxiety or chronic pain who may need to supplement throughout the day.